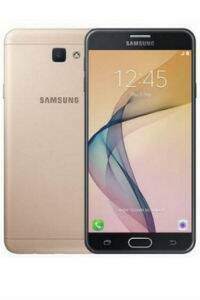 Samsung Galaxy J5 Prime was launched in September 2016. Samsung Galaxy J5 Prime features a 5-inch HD TFT LCD display with 720 x 1280 pixel resolution. Samsung Galaxy J5 Prime comes with 2GB RAM and 16GB storage version and is powered by a 1.4 GHz quad-core processor. Samsung Galaxy J5 Prime runs Android 6.0 Marshmallow. Samsung Galaxy J5 Prime features a 13MP rear camera with f/1.9 aperture, Auto Focus and LED Flash. The rear video camera support FHD (1920 x 1080) video recording at 30fps. The front camera is 5MP with f/2.2 aperture. Samsung Galaxy J5 prime has a non-removable 2,400 mAh battery. Sensors on the Samsung Galaxy J5 prime include: Accelerometer, Fingerprint and Proximity. Connectivity options on the Samsung Galaxy J5 prime are: Wi-Fi 802.11 b/g/n 2.4GHz, Wi-Fi Direct DLNA, hotspot and Bluetooth 4.2. The dimension of the Samsung Galaxy J5 prime are: 142.8 x 69.5 x 8.1 mm. Samsung Galaxy J5 prime comes in two colour options – Gold and Black. Samsung Galaxy J5 prime priced at Rs 14,790.